Ed Sheeran says he's quit Twitter after receiving a stream of abuse. "I've actually come off Twitter completely," he told The Sun. "I can't read it. "I go on it and there's nothing but people saying mean things. One comment ruins your day. But that's why I've come off it." The star, who has 19 million followers, says he'll keep the account open, but it will only share automatic updates from his Instagram page from now on. A quick scan of Twitter finds a number of negative - although not necessarily abusive - comments directed towards the 26-year-old. "Irritating ginger busker" is a particularly common insult; while the song Galway Girl has provoked a torrent of anger. "Revolting, fudged cultural appropriation," wrote David N about the jaunty jig, in which Sheeran describes falling for a girl who "played the fiddle in an Irish band". Another user described it as "awful 'diddly-eye leprachaun'" music, full of "stereotypical nonsense". Richard Roche had some helpful advice regarding the lyrics, which he described as: "Full of geographical inaccuracies (there's no pub on Grafton St)." 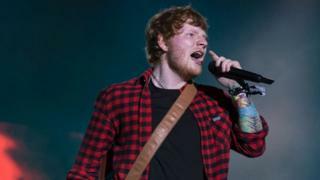 Most recently, Sheeran had to defend himself against accusations of using a backing track during his headline set at Glastonbury. The star uses a loop pedal during his performances, which allows him to record his vocal and guitar lines, creating a layered, looped accompaniment live, on the spot. "Is it a backing track or invisible musicians?!? Who's playing when Ed Sheeran stops?!?" wrote one mystified fan. "Couldn't he get real musicians? I like him but all a bit karaoke," wrote another. In his last personally-authored tweet, the star sounded exasperated by the accusations. "Never thought I'd have to explain it, but everything I do in my live show is live, it's a loop station, not a backing track. Please google," he wrote. 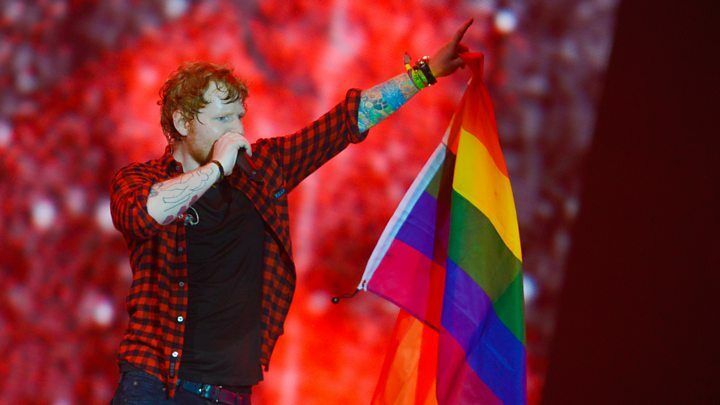 Other users took aim at Sheeran's televised Glastonbury show after he suffered guitar problems during the song Bloodstream. "Ed Sheeran come to my house and I will show you how to tune a guitar you useless mess," wrote one. Speaking to The Sun, Sheeran said he had "been trying to work out why people dislike me so much" but the simple answer is that he's the victim of his own success. His third album ÷ (Divide) is the year's biggest-seller, dominating the charts and radio around the world. In the UK, every song on the record made the top 20 of the singles chart, while the lead single, Shape Of You, spent 14 weeks at number one. That sort of ubiquity draws out the more mean-spirited and aggressive users of Twitter - which has gained a reputation for harbouring trolls. Stars including Miley Cyrus, Sue Perkins, Stephen Fry, Halsey and Avengers director Joss Whedon have all quit the site after suffering abuse. Others, including Selena Gomez and Tom Daley, have received death threats. (We saw no evidence of similar tweets to Sheeran, although it is possible such messages would have been deleted for violating Twitter's terms and conditions). Last year, Bloomberg reported that Disney chose not to pursue an acquisition of the social media network in part because it thought the bullying behaviour of some users might damage the film company's image. Twitter has since taken action to combat abuse - giving users better tools to mute or block trolls. Based upon a trawl of Sheeran's account, mean tweets are vastly outweighed by positive ones. Every time he posts a photo or a comment, the majority of responses are variations of, "I love you", "te amo" and "come to Portugal!" And if Sheeran ventures back onto the site, he'll find heartwarming messages like this one from Castie Collins, who wrote: "I'm learning guitar because of you." "Thank u @edsheeran for making great music so studying isn't always SO terrible," said Emily Estopare. Hannah Robinson added: "I'm sick and feel like crap but I turned on some Ed Sheeran songs and felt better." And Karen Porter had kind words for Sheeran's Glastonbury slot: "Could tell you were having the best time ever up on that stage," she said. "Amazing to see true talent and a genuine soul. Much love." Even the star's least-liked song received some (faint) praise from Sadie Lyon, who wrote: "My Uber driver knows the rap bit in Galway Girl."